‘Things Around the House’ is an exclusive show having intimacy as a watchword. 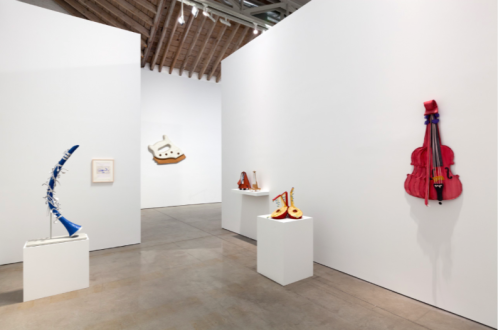 It displays over 100 works coming directly from the house and studio of the artistic couple formed by Claes Oldenburg and Coosje van Bruggen. The exhibition stares an accumulation of pieces from their moving in together in 1979 until her passing away in 2009. ‘Things Around the House’ is a not so typical Oldenburg and van Bruggen show. Used to their big scale indoor and outdoor installations dealing with a Pop Art vocabulary, this show enlightens smaller, more confidential pieces. 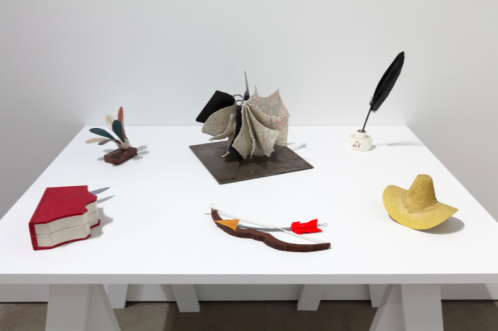 It is the practice of making, of creating that the exhibition underlines, being faithful to Oldenburg sayings that ‘Process is what keeps a thing alive, one things leads to another. One has to do more to ti – intensify color, play with material and scale, subject the form to gravity, make it collide with another object, turn it upside down or buy it halfway into the ground – so that it opens up multiple associations.’ The ongoing creative process of the couple is therefore a foundation for the many different scales pieces on display that go from a half eaten book to a decomposed violin, passing by an air basketball net. Moreover, it celebrates the fruitful collaboration that linked Oldenburg and van Bruggen for 30 years.